This course covers the theoretical foundation for different techniques associated with supervised machine learning models. A series of demonstrations and exercises is used to reinforce all the concepts and the analytical approach to solving business problems. In addition, a business case study is defined to guide participants through all steps of the analytical life cycle, from problem understanding to model deployment, through data preparation, feature selection, model training and validation, and model assessment. This course is the core of the SAS Viya Data Mining and Machine Learning curriculum. It uses Model Studio, the pipeline flow interface in SAS Viya that enables you to prepare, develop, compare, and deploy advanced analytics models. You learn to train supervised machine learning models to make better decisions on big data. 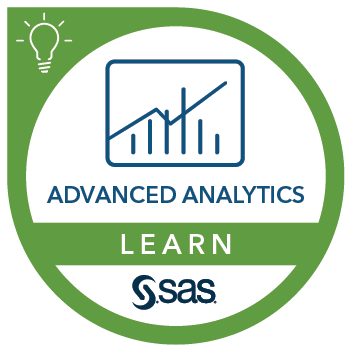 This course can help prepare you for the following certification exam(s): SAS Viya 3.4 Supervised Machine Learning Pipelines. develop a series of supervised learning models based on different techniques such as decision tree, ensemble of trees (forest and gradient boosting), neural networks, and support vector machines. deploy and manage analytical models under production. Before attending this course, participants should have at least an introductory-level familiarity with basic statistics. Previous SAS software experience is helpful but not required.